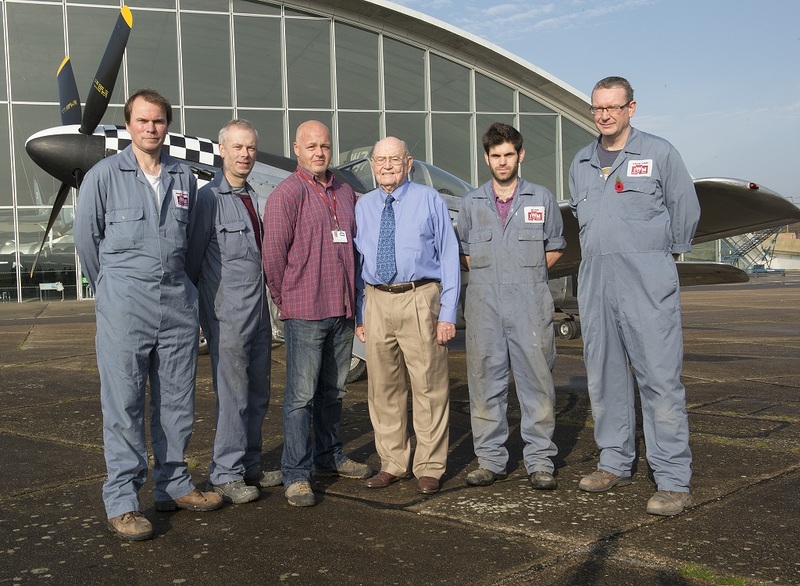 Today (Thursday 30 October) IWM Duxford’s newly conserved P-51 Mustang was unveiled by 90 year-old Second World War veteran US airman Huie Lamb. Huie served with the 82nd Fighter Squadron, 78th Fighter Group, United States Army Air Forces at RAF Duxford from August 1944 until the end of the Second World War. He was 20 when he arrived at RAF Duxford. Huie amassed over 200 hours of combat flying, destroying five and a half aircraft in the course of his 61 missions. The 78th Fighter Group flew a total of 450 missions out of RAF Duxford with a loss of 128 pilots. 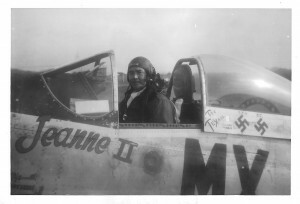 IWM Duxford’s P-51 Mustang represents Huie’s second aircraft, Etta Jeanne II. 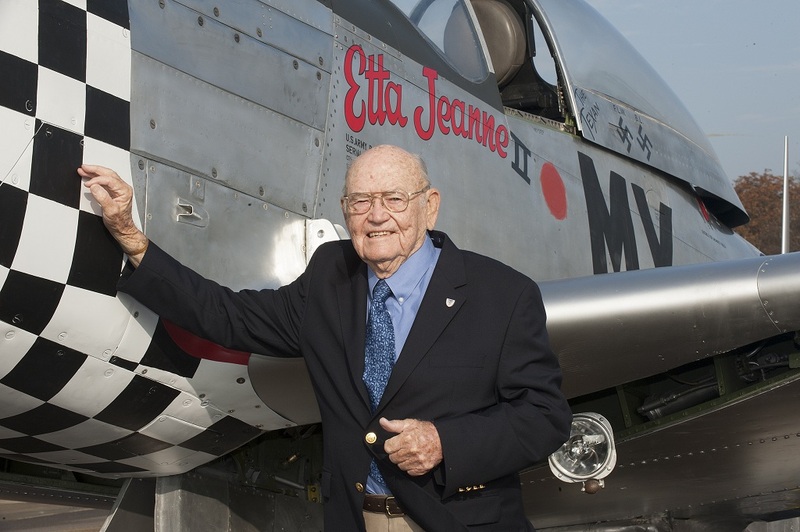 On his very first mission (29 December 1944) in his first aircraft, Etta Jeanne, Huie narrowly escaped death. He was one of the very few pilots to survive after an engine fire, bailing out and parachuting into the frigid waters of the North Sea. His first aircraft Etta Jeanne did not survive. He was rescued by another aircraft pilot who spotted him in the water. A doctor later told him that had he been in the water for five minutes longer, he would have died. IWM’s P-51 Mustang has been conserved and repainted in the markings and nose art of Huie’s wartime P-51 Mustang Etta Jeanne II. 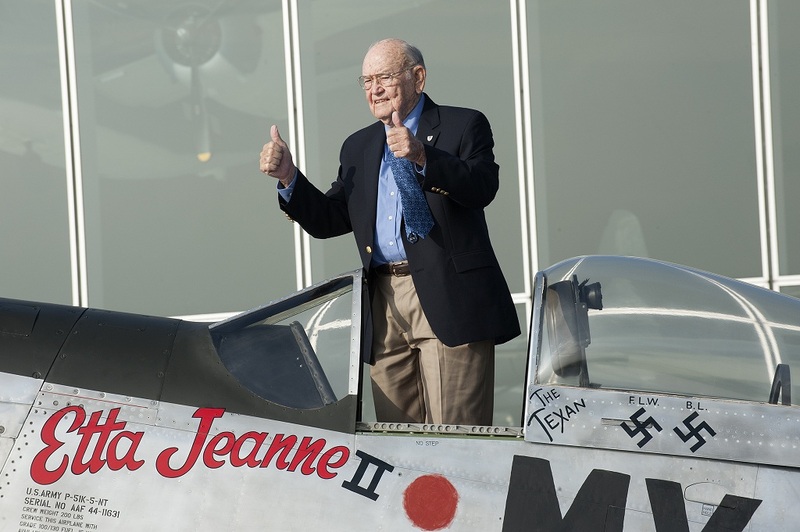 Both of Huie’s P-51 Mustangs were named after his younger sister. The P-51 Mustang will form the centrepiece for Huie Lamb’s story, told as part of the new interpretation in the American Air Museum, when it reopens in 2016. Our aim, in the redevelopment of the American Air Museum, is to inspire people to relate the objects in the museum’s collection to their own lives and to the world in which they live. We’ll be refreshing the American Air Museum to ensure that it is impactful for the next generation of visitors and helping visitors to understand the co-operative relationship between the United States and the United Kingdom, which was forged in the East of England during the First World War and the Second World War and which has shaped the modern world ever since. Huie’s story is also told on the new American Air Museum website, which was launched at the beginning of this month. The American Air Museum website is a digital record of the memories and stories of the men and women of the US Army Air Forces (USAAF) who found themselves serving their country from somewhere in England during the Second World War. This week, 724 English Heritage aerial photographs have been added to the American Air Museum website, many of which have not been previously seen by the public. The photographs show 157 Second World War airfields in the UK and date from between 1942 and 1947. They show the building of airfields, airfields in use and their post-war condition.